Ascites is the abnormal buildup of fluid in the abdomen. Technically, it is more than 25 mL of fluid in the peritoneal cavity. Symptoms may include increased abdominal size, increased weight, abdominal discomfort, and shortness of breath. Complications can include spontaneous bacterial peritonitis. In the developed world, the most common cause is liver cirrhosis. Other causes include cancer, heart failure, tuberculosis, pancreatitis, and blockage of the hepatic vein. In cirrhosis, the underlying mechanism involves high blood pressure in the portal system and dysfunction of blood vessels. Diagnosis is typically based on an examination together with ultrasound or a CT scan. Testing the fluid can help in determining the underlying cause. Treatment often involves a low salt diet, medication such as diuretics, and draining the fluid. A transjugular intrahepatic portosystemic shunt (TIPS) may be placed but is associated with complications. Effects to treat the underlying cause, such as by a liver transplant may be considered. Of those with cirrhosis, more than half develop ascites in the ten years following diagnosis. Of those in this group who develop ascites, half will die within three years. The term is from the Greek askítes meaning "baglike". Mild ascites is hard to notice, but severe ascites leads to abdominal distension. People with ascites generally will complain of progressive abdominal heaviness and pressure as well as shortness of breath due to mechanical impingement on the diaphragm. Ascites is detected with physical examination of the abdomen by visible bulging of the flanks in the reclining person ("flank bulging"), "shifting dullness" (difference in percussion note in the flanks that shifts when the person is turned on the side) or in massive ascites with a "fluid thrill" or "fluid wave" (tapping or pushing on one side will generate a wave-like effect through the fluid that can be felt in the opposite side of the abdomen). Other signs of ascites may be present due to its underlying cause. For instance, in portal hypertension (perhaps due to cirrhosis or fibrosis of the liver) people may also complain of leg swelling, bruising, gynecomastia, hematemesis, or mental changes due to encephalopathy. Those with ascites due to cancer (peritoneal carcinomatosis) may complain of chronic fatigue or weight loss. Those with ascites due to heart failure may also complain of shortness of breath as well as wheezing and exercise intolerance. Routine complete blood count (CBC), basic metabolic profile, liver enzymes, and coagulation should be performed. Most experts recommend a diagnostic paracentesis be performed if the ascites is new or if the person with ascites is being admitted to the hospital. The fluid is then reviewed for its gross appearance, protein level, albumin, and cell counts (red and white). Additional tests will be performed if indicated such as microbiological culture, Gram stain and cytopathology. The serum-ascites albumin gradient (SAAG) is probably a better discriminant than older measures (transudate versus exudate) for the causes of ascites. A high gradient (> 1.1 g/dL) indicates the ascites is due to portal hypertension. A low gradient (< 1.1 g/dL) indicates ascites of non-portal hypertensive as a cause. Ultrasound investigation is often performed prior to attempts to remove fluid from the abdomen. This may reveal the size and shape of the abdominal organs, and Doppler studies may show the direction of flow in the portal vein, as well as detecting Budd-Chiari syndrome (thrombosis of the hepatic vein) and portal vein thrombosis. Additionally, the sonographer can make an estimation of the amount of ascitic fluid, and difficult-to-drain ascites may be drained under ultrasound guidance. An abdominal CT scan is a more accurate alternate to reveal abdominal organ structure and morphology. Ascitic fluid can accumulate as a transudate or an exudate. Amounts of up to 35 liters are possible. Roughly, transudates are a result of increased pressure in the hepatic portal vein (>8 mmHg, usually around 20 mmHg), e.g. due to cirrhosis, while exudates are actively secreted fluid due to inflammation or malignancy. As a result, exudates are high in protein and lactate dehydrogenase and have a low pH (<7.30), a low glucose level, and more white blood cells. Transudates have low protein (<30 g/L), low LDH, high pH, normal glucose, and fewer than 1 white cell per 1000 mm³. Clinically, the most useful measure is the difference between ascitic and serum albumin concentrations. A difference of less than 1 g/dl (10 g/L) implies an exudate. Portal hypertension plays an important role in the production of ascites by raising capillary hydrostatic pressure within the splanchnic bed. Regardless of the cause, sequestration of fluid within the abdomen leads to additional fluid retention by the kidneys due to stimulatory effect on blood pressure hormones, notably aldosterone. The sympathetic nervous system is also activated, and renin production is increased due to decreased perfusion of the kidney. Extreme disruption of the renal blood flow can lead to hepatorenal syndrome. Other complications of ascites include spontaneous bacterial peritonitis (SBP), due to decreased antibacterial factors in the ascitic fluid such as complement. Ascites is generally treated while an underlying cause is sought, in order to prevent complications, relieve symptoms, and prevent further progression. In people with mild ascites, therapy is usually as an outpatient. The goal is weight loss of no more than 1.0 kg/day for people with both ascites and peripheral edema and no more than 0.5 kg/day for people with ascites alone. In those with severe ascites causing a tense abdomen, hospitalization is generally necessary for paracentesis. Salt restriction is the initial treatment, which allows diuresis (production of urine) since the person now has more fluid than salt concentration. Salt restriction is effective in about 15% of these people. Water restriction is needed if serum sodium levels drop below 130 mmol L−1. Since salt restriction is the basic concept in treatment, and aldosterone is one of the hormones that acts to increase salt retention, a medication that counteracts aldosterone should be sought. Spironolactone (or other distal-tubule diuretics such as triamterene or amiloride) is the drug of choice since they block the aldosterone receptor in the collecting tubule. This choice has been confirmed in a randomized controlled trial. Diuretics for ascites should be dosed once per day. Generally, the starting dose is oral spironolactone 100 mg/day (max 400 mg/day). 40% of people will respond to spironolactone. For nonresponders, a loop diuretic may also be added and generally, furosemide is added at a dose of 40 mg/day (max 160 mg/day), or alternatively (bumetanide or torasemide). The ratio of 100:40 reduces risks of potassium imbalance. Serum potassium level and renal function should be monitored closely while on these medications. Monitoring diuresis: Diuresis can be monitored by weighing the person daily. The goal is weight loss of no more than 1.0 kg/day for people with both ascites and peripheral edema and no more than 0.5 kg/day for people with ascites alone. If daily weights cannot be obtained, diuretics can also be guided by the urinary sodium concentration. Dosage is increased until a negative sodium balance occurs. A random urine sodium-to-potassium ratio of > 1 is 90% sensitivity in predicting negative balance (> 78-mmol/day sodium excretion). Diuretic resistance: Diuretic resistance can be predicted by giving 80 mg intravenous furosemide after 3 days without diuretics and on an 80 mEq sodium/day diet. The urinary sodium excretion over 8 hours < 50 mEq/8 hours predicts resistance. If the person exhibits a resistance to or poor response to diuretic therapy, ultrafiltration or aquapheresis may be needed to achieve adequate control of fluid retention and congestion. The use of such mechanical methods of fluid removal can produce meaningful clinical benefits in people with diuretic resistance and may restore responsiveness to conventional doses of diuretics. 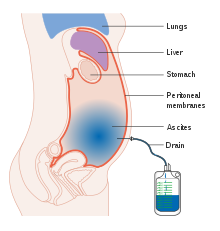 In those with severe (tense) ascites, therapeutic paracentesis may be needed in addition to medical treatments listed above. As this may deplete serum albumin levels in the blood, albumin is generally administered intravenously in proportion to the amount of ascites removed. Ascites that is refractory to medical therapy is considered an indication for liver transplantation. In the United States, the MELD score (online calculator) is used to prioritize people for transplantation. In a minority of people with advanced cirrhosis that have recurrent ascites, shunts may be used. Typical shunts used are portacaval shunt, peritoneovenous shunt, and the transjugular intrahepatic portosystemic shunt (TIPS). However, none of these shunts has been shown to extend life expectancy, and are considered to be bridges to liver transplantation. A meta-analysis of randomized controlled trials by the international Cochrane Collaboration concluded that "TIPS was more effective at removing ascites as compared with paracentesis...however, people with TIPS develop hepatic encephalopathy significantly more often". Exudative ascites generally does not respond to manipulation of the salt balance or diuretic therapy. Repeated paracentesis and treatment of the underlying cause is the mainstay of treatment. Complications involve portal vein thrombosis and splenic vein thrombosis: clotting of blood affects the hepatic portal vein or varices associated with splenic vein. This can lead to portal hypertension and reduction in blood flow. When a person with liver cirrhosis is suffering from thrombosis, it is not possible to perform a liver transplant, unless the thrombosis is very minor. In case of minor thrombosis, there are some chances of survival using cadaveric liver transplant. It has been suggested that ascites was seen as a punishment especially for oath-breakers among the Proto-Indo-Europeans. This proposal builds on the Hittite military oath as well as various Vedic hymns (RV 7.89, AVS 4.16.7). A similar curse dates to the Kassite dynasty (12th century BC). Comparable is also Numbers 5:11ff, where an accused adulteress is confirmed with swelling of the abdomen. ^ a b "Ascites". National Library of Medicine. Retrieved 14 December 2017. ^ a b c d e f g h i j k "Ascites - Hepatic and Biliary Disorders". Merck Manuals Professional Edition. May 2016. Retrieved 14 December 2017. ^ a b c d e f g h i j Pedersen, JS; Bendtsen, F; Møller, S (May 2015). "Management of cirrhotic ascites". Therapeutic advances in chronic disease. 6 (3): 124–37. doi:10.1177/2040622315580069. PMC 4416972. PMID 25954497. ^ Staff writer (2010). "Ascites". Dictionary.com: An Ask.com Service. Oakland, CA: IAC. Retrieved December 14, 2017. ^ a b c Warrell DA, Cox TN, Firth JD, Benz ED. Oxford textbook of medicine. Oxford: Oxford University Press, 2003. ISBN 0-19-262922-0. ^ Branco-Ferreira M, Pedro E, Barbosa MA, Carlos AG (1998). 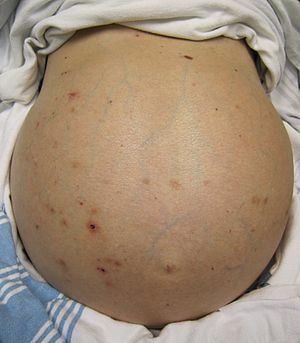 "Ascites in hereditary angioedema". Allergy. 53 (5): 543–5. doi:10.1111/j.1398-9995.1998.tb04098.x. PMID 9636820. ^ Runyon BA, Montano AA, Akriviadis EA, Antillon MR, Irving MA, McHutchison JG (August 1992). "The serum-ascites albumin gradient is superior to the exudate-transudate concept in the differential diagnosis of ascites". Ann. Intern. Med. 117 (3): 215–20. doi:10.7326/0003-4819-117-3-215. PMID 1616215. ^ Moore, K. P.; Wong, F.; Gines, P.; Bernardi, M.; Ochs, A.; Salerno, F.; Angeli, P.; Porayko, M.; Moreau, R.; Garcia-Tsao, G.; Jimenez, W.; Planas, R.; Arroyo, V (2003). "The Management of Ascites in Cirrhosis: Report on the Consensus Conference of the International Ascites Club". Hepatology. 38: 258–66. doi:10.1053/jhep.2003.50315. PMID 12830009. ^ a b Shear L, Ching S, Gabuzda GJ (1970). "Compartmentalization of ascites and edema in patients with hepatic cirrhosis". N. Engl. J. Med. 282 (25): 1391–6. doi:10.1056/NEJM197006182822502. PMID 4910836. ^ a b Ginés P, Arroyo V, Quintero E, et al. (1987). "Comparison of paracentesis and diuretics in the treatment of cirrhotics with tense ascites. Results of a randomized study". Gastroenterology. 93 (2): 234–41. PMID 3297907. ^ a b Salerno F, Badalamenti S, Incerti P, et al. (1987). "Repeated paracentesis and i.v. albumin infusion to treat 'tense' ascites in cirrhotic patients. A safe alternative therapy". J. Hepatol. 5 (1): 102–8. doi:10.1016/S0168-8278(87)80067-3. PMID 3655306. ^ a b Gatta A, Angeli P, Caregaro L, Menon F, Sacerdoti D, Merkel C (1991). "A pathophysiological interpretation of unresponsiveness to spironolactone in a stepped-care approach to the diuretic treatment of ascites in nonazotemic cirrhotic patients". Hepatology. 14 (2): 231–6. doi:10.1002/hep.1840140205. PMID 1860680. ^ a b Ginès P, Cárdenas A, Arroyo V, Rodés J (2004). "Management of cirrhosis and ascites". N. Engl. J. Med. 350 (16): 1646–54. doi:10.1056/NEJMra035021. PMID 15084697. ^ Fogel MR, Sawhney VK, Neal EA, Miller RG, Knauer CM, Gregory PB (1981). "Diuresis in the ascitic patient: a randomized controlled trial of three regimens". J. Clin. Gastroenterol. 3 Suppl 1: 73–80. doi:10.1097/00004836-198100031-00016. PMID 7035545. ^ a b c Runyon BA (1994). "Care of patients with ascites". N. Engl. J. Med. 330 (5): 337–42. doi:10.1056/NEJM199402033300508. PMID 8277955. ^ Runyon BA, Heck M (1996). "Utility of 24-hour urine sodium collection and urine Na/K ratios in the management of patients with cirrhosis and ascites". Hepatology. 24: 571A. ^ Spahr L, Villeneuve JP, Tran HK, Pomier-Layrargues G (2001). "Furosemide-induced natriuresis as a test to identify cirrhotic patients with refractory ascites". Hepatology. 33 (1): 28–31. doi:10.1053/jhep.2001.20646. PMID 11124817. ^ Hunt SA, Abraham WT, Chin MH, et al. (2005). "ACC/AHA 2005 Guideline Update for the Diagnosis and Management of Chronic Heart Failure in the Adult: a report of the American College of Cardiology/American Heart Association Task Force on Practice Guidelines". Circulation. 112 (12): 154–235. doi:10.1161/CIRCULATIONAHA.105.167586. PMID 16160202. ^ Adams KF, Lindenfeld J, Arnold JM, Baker DW, Barnard DH, Baughman KL, Boehmer JP, Deedwania P, Dunbar SB, Elkayam U, Gheorghiade M, Howlett JG, Konstam MA, Kronenberg MW, Massie BM, Mehra MR, Miller AB, Moser DK, Patterson JH, Rodeheffer RJ, Sackner-Bernstein J, Silver MA, Starling RC, Stevenson LW, Wagoner LE (2006). "Heart Failure Society of America (HFSA) 2006 Comprehensive Heart Failure Practice Guideline". J Cardiac Failure. 12 (1): e1–e122. doi:10.1016/j.cardfail.2005.11.005. PMID 16500560. ^ Cosby RL, Yee B, Schrier RW (1989). "New classification with prognostic value in cirrhotic patients". Mineral and electrolyte metabolism. 15 (5): 261–6. PMID 2682175. ^ Saab S, Nieto JM, Lewis SK, Runyon BA (2006). "TIPS versus paracentesis for cirrhotic patients with refractory ascites". Cochrane Database of Systematic Reviews (4): CD004889. doi:10.1002/14651858.CD004889.pub2. PMID 17054221. ^ Oettinger, Norbert. Die Militärischen Eide der Hethiter. Wiesbaden, 1976. ISBN 3-447-01711-2.